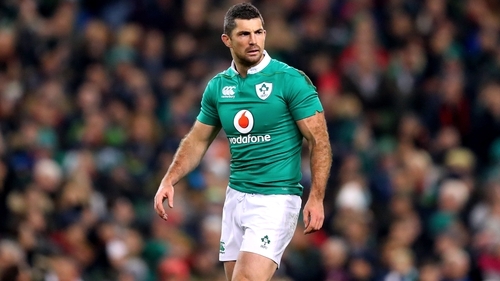 Rob Kearney's arm injury could rule him out of the rest of Ireland's RBS 6 Nations campaign, with the Leinster full-back facing surgery on a damaged bicep. Kearney was forced out of Saturday's 63-10 destruction of Italy in Rome, though coach Joe Schmidt was confident afterwards that the 30-year-old would not be out of action for long. "Rob got a bruise on his bicep, just with awkward contact," he told RTÉ Sport. "A couple of days should see him right." However, according to the Irish Independent, the injury is worse than feared, and Kearney will struggle to regain full fitness for any of the remaining games against France, Wales and England. In more positive news Peter O'Mahony looks to be on track to return to the fold against the French on Saturday week. Munster director of rugby Rassie Erasmus said the back-row will not play against the Ospreys in the Pro12 this weekend but expects him to be fit and ready to go for the Aviva Stadium showdown. Robbie Henshaw also hobbled out of the Italian victory but his bruised quad is not serious and he'll train at the three-day camp in Monaghan this week.